A leisurely walk in Midtown East from Paley Park on E. 53rd Street to the United National Headquarters in Turtle Bay, ending with a grand finish on E. 42nd Street, takes in many New York landmarks as well as international treasures. Indoors and out, the walk features exemplary gardens, urban retreats, and prewar buildings of note. In addition, many of the twenty-five stops noted here highlight the promise of New York at mid-century and the civic optimism of the postwar years. The walk takes on an international spirit as a few buildings are inspired by the architectural modernism of the International Style. A few specific places serve as cultural embassies for their respective countries. 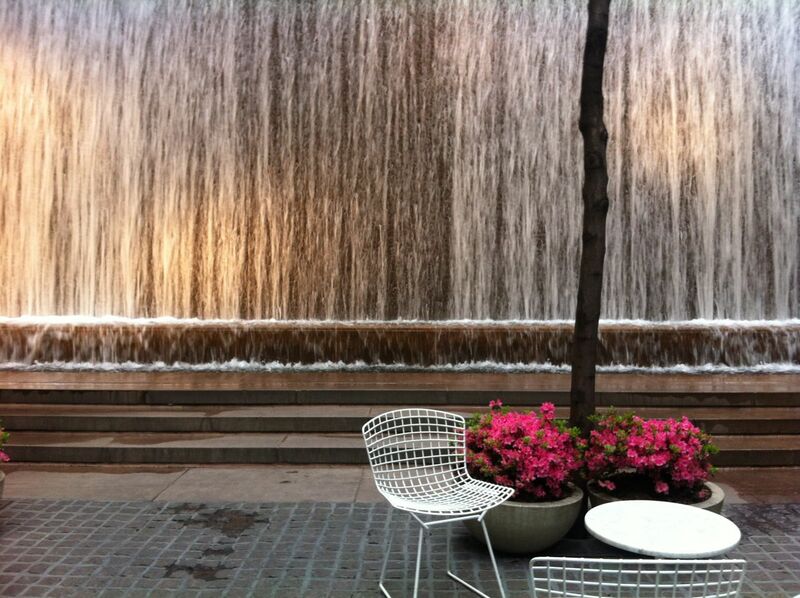 Begin the walk in Paley Park, 3 E. 53rd St., just east of Fifth Avenue. Beginning with Paley Park, the walk includes many public spaces that encourage sociability and provide much-needed breaks from the fast pace of the city. Take note of the ones you think are most successful and why. The walk, which connects the dots to all these spots (with one detour), is about 2.5 miles long but with many rests along the way. The excursion is a great way to spend a free afternoon, winding up at Grand Central Terminal. Along the way, you’ll also encounter three glamorous celebrities - Greta Garbo, Katharine Hepburn, and Audrey Hepburn, all active players in the life of the city. The map at the end of this post marks a path that connects the 25 things. The walk works well for the solo traveler or with a group of friends. 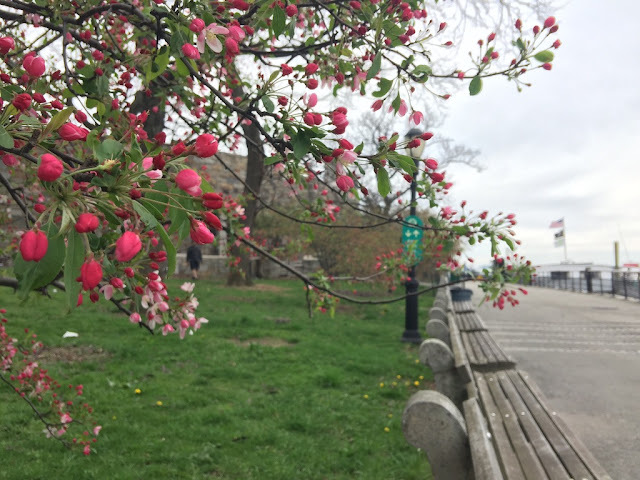 Begin your walk in this small park built in 1967 on the site of the former Stork Club at 3 E. 53rd Street. William S. Paley, the founder of CBS, donated the park and named it after his father. In urban planning, this park is considered a model of successful public places. The necessary ingredients of public life are assembled here - a setback from the street, a water feature, nearby food, and moveable chairs amendable to solitude or to company. The waterfall makes enough noise to drown out traffic but not conversation. Stephen Sondheim's landmark musical Company (1970) includes a reference to this park - "Imagine being in a tiny, quiet, little pocket of the park right here in the middle of the busy, noisy east 50s." Look for the arcade in the Olympic Tower just off Fifth, connecting St. Patrick's on E. 51st St. with E. 52nd. Between E. 52nd and E. 53rd. and between Madison and Park. Walk into the atrium, and you’ll see an indoor waterfall and a few stores in the arcade, including Chartwell Booksellers, a bookshop specializing in Winston Churchill material. Lever House (1950 - 1952), a glass-box modernist building by Gordon Bunshaft of the firm Skidmore, Owings, and Merrill. At the time it opened, the Lever House, designed in part to showcase the cleanliness of Lever's soap products, heralded the much-delayed arrival of the International Style in the U.S. Fifty years or so after its construction, the green-tinted Lever House looks humble in the company of nearby giants. 375 Park Avenue. 1958. Architects: Ludwig Mies van der Rohe, Philip Johnson (interiors). International Style. Modern. Talk, dark, and handsome, clad in bronze and glass, the Seagram defined the post-war office building. The building also introduced the modern plaza, popular with office workers. A church in the Episcopal tradition, St. Bart's is known for its Byzantine architecture and music program. 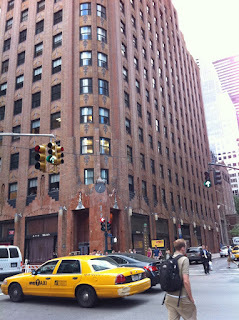 • General Electric Building/originally the RCA Visitor Building. 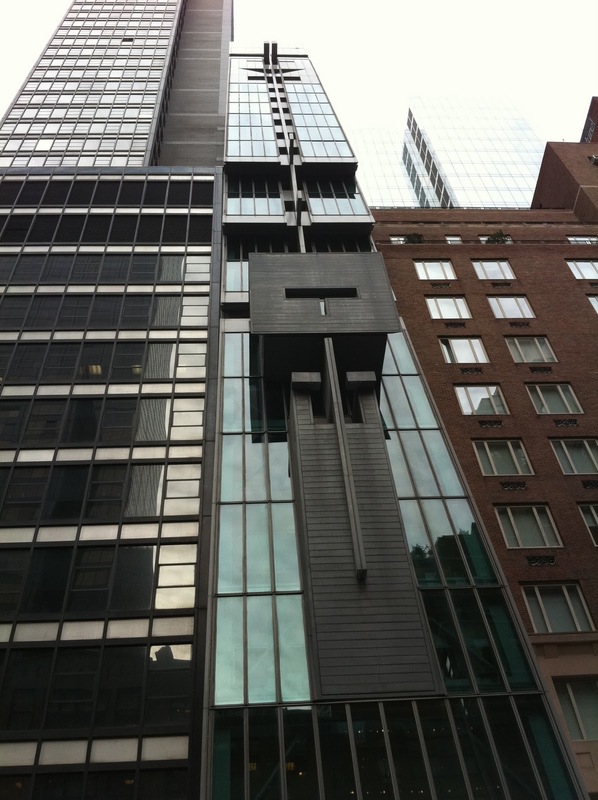 570 Lexington Avenue. 1929-1930; restored in 1995. A terrific Art Deco building. Look for the retro subway entrance. Originally named The Summit (later, Loews New York and after, the Metropolitan, before the Doubletree), the hotel was the creative inspiration of architect Morris Lapidus. Opened in January 1961, the building seemed way outside the limits of New York architectural tastes. 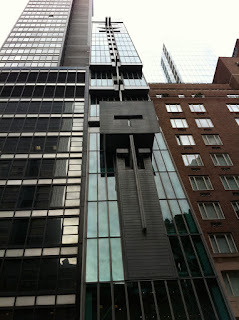 The building also looked out of place among its more restrained modernist neighbors. It’s a fun building from the same architect who designed Miami's The Fontainebleau in 1954. Hideo Sasaki's masterpiece of a pocket park features a 25-foot waterfall that washes away city stress. With comfortable movable chairs and a zen-like design, the park provides one of the most successful types of spaces in our urban fabric. 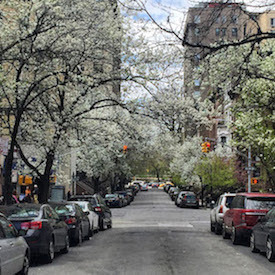 Take this detour if you want to see the street where Greta Garbo lived. 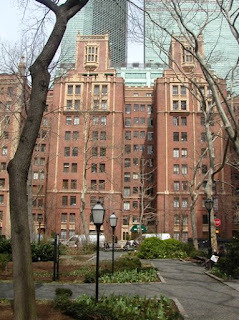 In October of 1953, two years after becoming a U.S. citizen, film legend Garbo bought a spacious apartment in The Campanile at 450 E. 52nd St. A building of understated elegance by today's standards, the apartment building served the needs of discreet older New York families as well as other movie stars. The building, which takes its architectural inspiration from the counterpart in Venice's Piazza San Marco, sits at the far quiet south end of the street and with views overlooking the East River. Garbo lived on the fifth floor with a view of the river and the Queensboro Bridge, and she decorated her seven rooms with attractive antiques and art. From 1953 until her death on April 15, 1990, Garbo spent much of her time walking the nearby streets. As of this posting, her apartment is on the market. Look for the sign indicating Katharine Hepburn Place at the corner of E. 49th Street and 2nd Avenue and the garden at Dag Hammarskjöld Plaza. She was a longtime Turtle Bay resident and neighborhood activist who loved flowers. The understated and handsome row houses on E. 48th and 49th Street between Second and Third Aveneues in the historic district (designated 1966) surround a shared garden with a fountain. The Villa Medici in Tuscany inspired the fountain design. Hepburn lived at 244 E. 49th Street for decades. Bob Dylan lived next door at 242 E. 49th St.
By the 1990s the park itself had gone into decline, so a nonprofit community organization, Friends of Dag Hammarskjold Plaza was formed with the mission to beautify and preserve this place, historic not just for the neighborhood of Turtle Bay but also for the world. Dedicated in 1965, designed by architect George J. Sole, this small Catholic church near the UN hosted a visit from Pope Paul VI on October 4, 1965. A small garden with a fountain continues the hidden gardens theme of this walk. First Ave between E. 42nd St. and E. 48th St. 1952. Recently renovated. Architect: Oscar Niemeyer (overall design). The United Nations complex, built in 1949 and 1950 on seventeen acres, symbolizes international utopianism. Like Rockefeller Center, completed a decade before, the buildings were designed by an international committee of architects. The main building housing the Secretariat is based on a design by Le Corbusier. Go inside if you have the time. Audrey Hepburn, while best known as embodying one of the city's most famous fictional women (Holly Golightly), actively served as a UNICEF ambassador. The sculpture “Spirit of Audrey” sits in front of this garden. The building, constructed in 1928, was designed to train designers in the style of the École des Beaux-Arts. By the time the school was constructed, the modernist movement was staging a revolution against the ornamental trappings of the established school, and the traditional skills and accompanying design philosophies were fading out. The Beaux-Arts Institute of Design building now houses the Permanent Mission of Egypt to the United Nations. Stop at the end of the street for a great view of the UN Secretariat Building. These 12 buildings in the Tudor revival style were built in years 1925-28 as rental units to keep middle class residents from fleeing to the suburbs. Designed by architects Fred French and H. Douglas Ives, the city within a city served to clean up the area's worst slums as an early example of urban renewal. In 1988 the Landmarks Preservation Committee designated Tudor City as an historic district. Influential atrium building from 1963-1967 by architects Kevin Roche John Dinkeloo is considered one of the best buildings of the late International Style. The soaring Daily News building, one that mild-mannered reporters could leap at a single bound, was completed in 1930, roughly the same time as the Empire State Building and the Chrysler Building. Be sure to step into the lobby to see the spinning globe. 405 Lexington Ave. 1930. Architect: William Van Alen. Art Deco. Streamline Moderne. The grand Art Deco lobby is open to the public from 8 a.m. to 6 p.m. Monday through Friday and closed on holidays. 89 E. 42nd St. at Park Avenue. 1903. 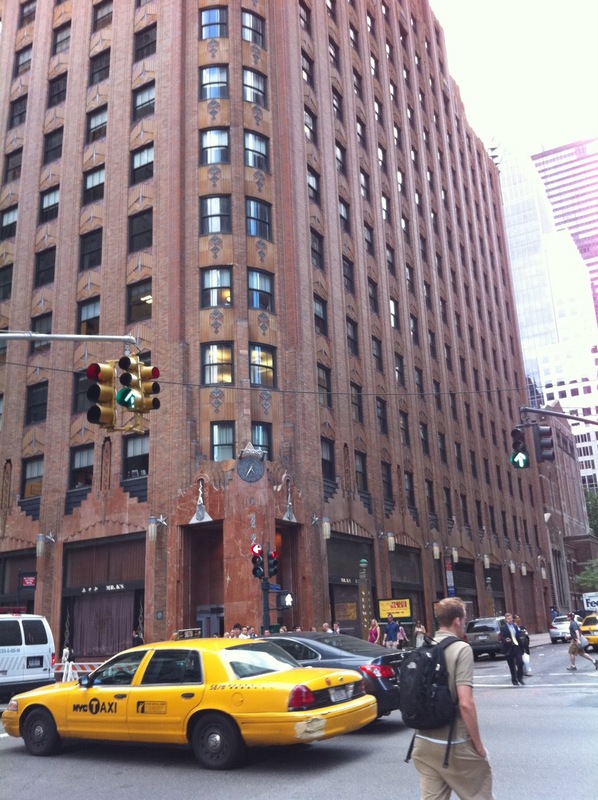 Architects: Alfred T. Fellheimer, John Wellborn Root. Beaux-Arts. This heavenly Beaux-Arts style palace of transit, constructed from 1903 to 1913 and successfully restored in 1998, features grand staircases, chandeliers, and a soaring ceiling vault painted in cerulean blue and decorated with a zodiac. A good starting point for a walk, too. Read more. Formerly the Pan Am Building (1963), the massive Met Life Building was designed by Emery Roth & Sons, Pietro Belluschi and Walter Gropius. The 59-store building dominates views of Park Avenue and upstages all nearby skyscrapers, including the Chrysler Building. Walking Off the Big Apple is fully mobile for on-the-go adventures.